Young but Master Digital Art has devoted his life to assist in nation building and also as philanthropist. The young talent artiste has on all his social media pages assured his fans and fathers a digital photo painting promo coming FATHER’S DAY celebration. 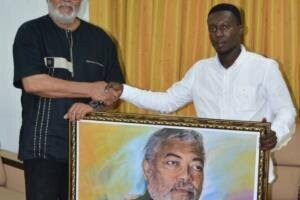 He has this time contributed his quota to the BBnz foundation club founded for the street children of Accra who are been taught by teachers. They also receive timely motivational speeches from their mentors and were lucky to have the digital painter, Danny Arthurz few weeks ago. He donated food items and toiletries including 8 bag of rice, bags of sugar, bag of onion, packs toilet roll etc worth over 2000 Ghana cedis. Danny Arthurz spent time with the students, interacted and took photographs with them which made them feel loved. Reporter: What is digital painting? Danny: Digital painting is an emerging art form in which traditional painting techniques (such as watercolor, oils, impasto, etc.) are applied by means of a computer, a digitizing tablet and stylus, and software. Reporter: How long have you been this business? Danny: 3 years in business now. Reporter: Woooww,… It must be a very difficult job, is it? Danny: Yes please very difficult but God made it easy for me. Because i had the passion for it. So the passion that i had made it easy for me. Reporter: Great, but is it lucrative as well? Danny: It’s very much profitable here in Ghana now. At first it wasn’t because they had that idea that it’s done digitally. But i think now people are really in love with. Also there are parents who calls me to mentor their children for them on art. Reporter: Does one need investors as a digital painter? Danny: Sure sir. As a start up business i will need investors to invest in my business. Seporter: Wonderful… Looking at your paintings, most are great celebrities and personalities, how do you meet them? Danny: Well i will say it’s God’s grace that has found me. Sometimes i don’t even plan to meet them but someone will see it and just send you to meet them. I painted Ama k abebrese and that’s when my breakthrough started. Reporter: Beautiful breakthrough then…now tell us, who is Danny Arthurz? Danny: Dannyarthurz is a young guy of 26 years. He is very humble guy. and Danny Arthurz is the new definition of digital painting and graphic design. His quest for excellence and attention to detail makes him a force to reckon in the creative art industry. Reporter: “Youngest celebrity”…. I heard you did something with BBnZ, can you brief us? Danny: Yea BBnz foundation club is founded for the street children of Accra and they have teachers who educate them. Reporter: Woowww woooww… June brings us FATHER’S DAY, my favourite day… What do have for all fathers and your fans, any Father’s Day promo? Danny: I want to say a very big thank you to my Mum Mrs Anita Arthur Baidoo for her support over the years. She’s been very supportive. AND oscar Bimpong and AUNTIE Baaba Arthur of Embalinks Gh for their great support as well. Also to my uncle Mr Ebenezer AMPARBIN . Finally not forgetting the guy who really inspired me to have that interest in Art Patrick Asiamah QUARM. Reporter: Yes I was just about to ask you exactly that, thanks for being smart… Well before I left you go, kindly give us final words. Danny: My final words for the youth in Ghana is if u are a young guy amd u find urself having any skills or talent just develop it to your profession. Secondly they should associate themselves to people who will really push them in life. Reporter: Ok all too soon I am done with you, Danny thanks for passing through. Keep the good job gentleman. Danny was born Akim Oda in the Eastern Region but grew up in Top Ten a suburb in Takoradi in the Western Region. He has his basic education at Bedu Addo Methodist school, secondary education at Fijai Senior High and he is a graduate from Takoradi polytechnic. He has love painting from childhood, he loves to sing he a very good “abochi voice”. Below are some paintings done by Danny. Surprise your father or any man who represent a father in your life a DIGITAL PAINTED PHOTO.